In the last decades the space sector has acquired growing importance outside the US, Europe and the West and saw an increasing activity from other actors. In fact, although OECD (Organisation for Economic Cooperation and Development) countries accounted for the largest space budgets globally in 2013 (USD 52B using purchasing power parities, or PPPs), an increasing share of worldwide space activities takes place outside it, especially in Brazil, the Russian Federation, India and China (about USD 23.9B PPPs). The analysis of the space sector and economy in Russia, India, China plus Japan (member of OECD since 1964) is thus functional to identify the trends of major geopolitical actors outside the European arena. A Chinese Long March II-F rocket loaded with a Shenzhou-9 spacecraft carrying Chinese astronauts; a Russian Zenit-2SB rocket with a Phobos-Grunt spacecraft; a Japanese H-2A rocket carrying a radar satellite; and an Indian PSLV-C18 rocket carrying an Indian-French satellite. – Credits: Reuters; Associated Press; Associated Press and Agence France-Presse/Getty Images. Federal Space Agency Roscosmos has the tasks of implementing the Federal Space Program, managing launch bases, state infrastructures and coordinating international cooperation. In 2012 the budget for Roscosmos was 150 billion rubles (USD 4.64B) with an increase of 30.43% from the previous year’s budget of 115 billion rubles (USD 4.12B). At the end of 2012 Russia announced a new space development plan engaging the federal government in investing 2.1 trillion rubles (USD 64.9B) in space projects between 2013 and 2020. President Putin provided similar data on financial engagement in 2013, saying that by 2020 the Russian government is planning to allocate some 1.6 trillion rubles (about USD 52B) to the national space industry. Considering the strategic value of a leadership role in space for Russia, the need to boost its manned spaceflight capabilities and to overcome delays on commercial communications satellites and other space-related industries, Putin showed the intention of transforming Roscosmos into a space industry ministry. A majority part of space industry enterprises belongs to the Russian state and the project of transferring national agency’s responsibilities to a single space ministry, that should only be done after Roscosmos is “fully equipped”, responds to the need of preserving a central role in global space activities and fostering efficiency and competitiveness. Budgetary plans cover human spaceflight, space launch vehicle development, the GLONASS satellite navigation system, space science and robotic space exploration activities. Russia’s space program has always been strongly focused on manned space flights, comprising for decades an average of 58% of the space budget and representing about 42% of Roscosmos’ budget in 2011. Some Russian space officials have therefore expressed concern that this proportion is too high and may impede development of space science and robotics activities. To fill the existing gap in some satellite industry’s market segments, Putin stated that Russia must “keep the leader’s experience of the manned flights and catch up in other space exploration programs”. As regards to investments in space infrastructure, in 2011 Russia began constructing the Vostochny Cosmodrome in the Amur region in the Russian Far East. Russia currently leases the Baikonour Cosmodrome from Kazakhstan for about $115 million a year with a contract scheduled until 2050. The opening of the Vostochny facility will presumably replace Baikonour as the center of Russia’s space infrastructure for non-commercial launches. In 2015 Roscosmos announced that national space program will include a series of robotic missions to lunar orbit and the surface of the Moon in 2020s in preparation for a visit by cosmonauts in the 2030s and that Russia plans to participate to the ISS partnership until 2024, then undock its own modules to create a standalone base in orbit. Indian Space Program aims at achieving self-reliance in space technology and evolving application program to meet the developmental needs of the country. In 1972 the Space Commission and the Department of Space (DOS) were established to formulate and implement space policies and programs. The Space Commission formulates the policies and oversees their implementation, whereas the Department of Space, directly under the authority of the Prime Minister, mainly implements space programs through the Indian Space Research Organization (ISRO) and other laboratories. For fiscal year 2012 the combined space budgets of Department of Space, including ISRO, and the Ministry of Earth Sciences’ Satellite Services program amounted at 67.315 billion rupees (USD 1.21B). The Indian Planning Commission establishes in 5-year planning cycles the budgets and policies of DOS and ISRO. The latest plan 2012-2017 assigned 397.5 billion rupees to DOS (about USD 7.4B) with an estimated budget for ISRO of 68 billion rupees (about USD 1.2B) in 2013. India has established two major space systems, the Indian National Satellite (INSAT) for telecommunication, television broadcasting and meteorological service and the Indian Remote Sensing Satellite (IRS) for natural resource monitoring and management and has realized two operational launch vehicles, Polar Satellite Launch Vehicle (PSLV) and Geosynchronous Satellite Launch Vehicle (GSLV). Lately, the biggest budget line has been devoted to access to space technologies and ISRO is currently working on a larger geostationary launch vehicle, GSLV-MkIII, which could launch commercial telecommunications satellites. INSAT is one of the largest domestic communication satellite systems in Asia-Pacific region with 9 operational communication satellites placed in Geo-stationary orbit. – Credits: ISRO. India’s main goals until 2025 include the expansion of operational services in communications and navigation (i.e. Indian Regional Navigational Satellite System – IRNSS); the development of improved imaging capabilities for natural resource management, weather and climate change studies; planetary exploratory missions; the development of heavy lift launcher and reusable launch vehicles and a human space flight program. China’s space activities are responsibility of the China National Space Administration (CNSA), the People’s Liberation Army (PLA), that operates the country’s overall government space program, including human spaceflight, as well as all Chinese launch facilities, and other agencies. Obtaining transparent data on national space activities and budget is difficult; the Space Foundation estimates that on average, the major spacefaring nations—excluding the United States and Russia, where spending is significantly higher than in other countries—devote approximately 0.042% of their current-price GDP to civil space activities. Using this method and China’s 2011 current-price GDP of 47.156 trillion yuan, the country’s 2012 space spending can be estimated at 19.64 billion yuan (USD 3.09B). Chinese space policy’s objectives are related to promoting the country’s scientific, economic and social development, securing its national security and independence and improving its international influence by engaging in international cooperation. The space industry plays an important role in China’s comprehensive development strategy. Its revenues represented some 135 billion yuan in 2013 (around USD 22B) with 25.000 employees in industrial space manufacturing working in state-owned enterprises, private enterprises and, especially, governmental bodies, public research centers and administrations. Human spaceflight program, known as Project 921, is central in space strategy and Chinese officials estimate that 39 billion yuan (USD 6.12B) has been spent on it since 1992. Currently China is assembling the Long March 5 of the Long March rocket family, a 62-meter-tall, 800-ton rocket that can carry up to 25 tons into Low Earth Orbit (LEO), or a 14-ton spacecraft bound for Mars or the Moon. LM-5 would allow China to launch larger and more effective spy imaging satellites and unmanned spaceplanes, thus boosting, among other things, its military and scientific space capabilities. China’s space program objective is to build a permanent space station by 2020 and from there send an astronaut to the Moon in the next few years. Apart from the main space projects, the Chinese space industry is looking at further commercializing its space initiatives including the export of satellite components to Western markets. 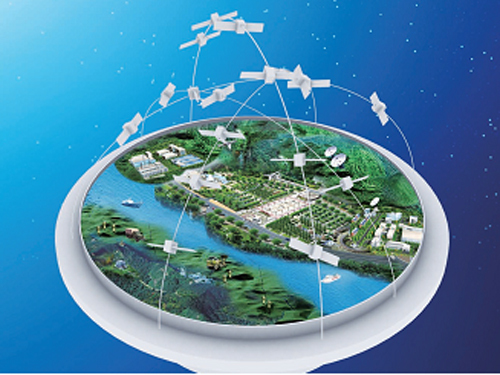 Beidou Satellite Navigation and Positioning System. – Credits: CNSA. Japan manages its space activities through the Japan Aerospace Exploration Agency (JAXA). In 2012 new legislation enabled the Prime Minister’s Cabinet Office to take control of the planning and budgeting of government space program and removed an article in the JAXA Law which had restricted its ability to pursue military space programs. In 2012 Japan allocated 269.2 billion yen (USD 3.73B) for space programs across the government, excluding the space-related budget allocated to the Ministry of Defense, which totaled 28.8 billion yen (USD 0.361B). 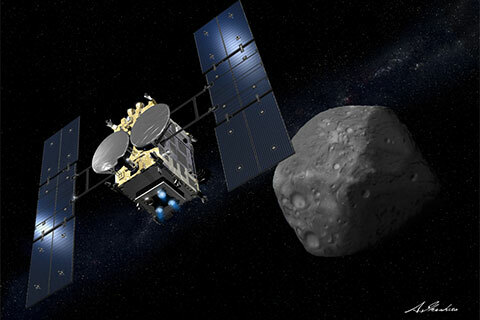 For fiscal year 2013, the Advanced Land Observing Satellite 2 (ALOS-2) and the Hayabusa 2 asteroid sample return mission were among priority programs identified in space budget request. Asteroid Explorer Hayabusa 2. – Credits: JAXA. Japan’s future space priorities include the development of the Information Gathering Satellite (IGS) system, a four-satellite constellation composed of two optical and two radar satellites, which provides reconnaissance and observation capabilities focused on North Korea and East Asia, and further engagement in the Quasi-Zenith Satellite System (QZSS) for navigation. In 2013 Japan announced that Mitsubishi Electric Co. (Melco) would be tasked to complete QZSS, meant to enhance the precision of the US GPS positioning, navigation and timing satellites over the Pacific Ocean region. Since 2011, Japan is also developing a small 3-stage launcher, known as Epsilon. 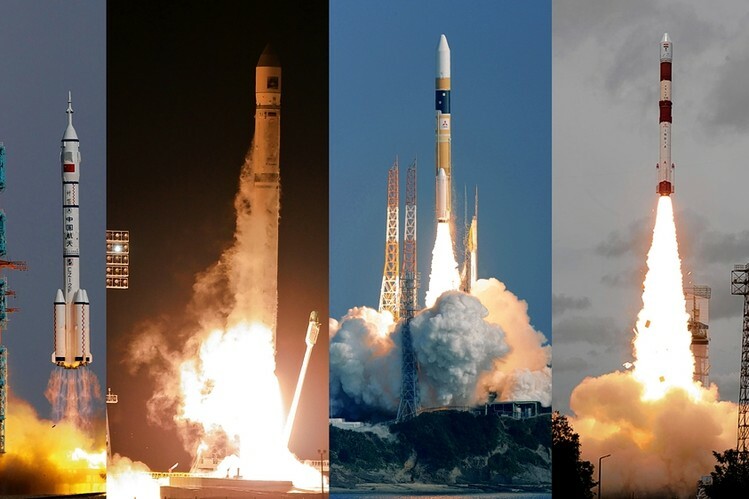 According to OECD, after the development of a new launcher and satellite programs in the late 2000s, the Japanese space industry revenues have remained relatively flat at around 260 billion yen annually (about USD 2.6B).